Africa is the second largest Continent on earth and has a very diverse of ecosystem. About 22% of the African Continent is actually occupied by forests and woodlands, an estimated 650 million hectares of Africa’s land area according to the Food and Agriculture Organization of the United Nations (the FAO). This also plays a large role on the global screen accounting for about 17% of the total global forest cover. Despite the fact that a very small percentage of the forest is protected, Africa forest still plays a very important role in the provision of resources, from a human standpoint, and it is a reservoir of great biological diversity within its ecological Landscapes. The African forest is very engaging, viewing from the sepia-toned woodlands of the great Tanzania-Zimbabwe frontier to the sprawling rainforest of the Congo Basin and even the upper Guinea forest of Southern Guinea; we see an unending sprout of ecological activities within the African forests. Africa is blessed with one of the richest ecological systems in the world, with Africa having one of the largest Tropical forests in the world. Among the different forests in Africa, we name the Largest of them giving a brief description of them. CONGO FOREST: Congo forest is the largest forest in Africa and the second largest in the world, with a total coverage of 695,000 sq mi. The Congo forest cuts through parts of Central African Republic, Democratic Republic of Congo, Cameroon, Republic of Congo, Gabon, and Equatorial Guinea. The forest houses vegetations like the African oak, Red cedar, Mahogany, and Dense upper canopy. The Congo forest also houses wildlife including the buffalo, antelopes, elephant, chimpanzees, crocodile, and many more animals and fishes. MAU FOREST: Mau forest located in the Rift Valley of Kenya stands as the largest indigenous montane forest in the whole of East Africa and the second largest forest in Africa with a total coverage area of 675,000 acres (273,300 hectares). With the highest rainfall rates in Kenya, the Mau forest has the largest water catchment area with numerous rivers originating from the forest. Vegetations in the Mau forest include Papyrus, Chamomile, Opium poppy, and Mangrove. The forest is blessed with wildlife like the Mountain Bongo, Oryx, Elephant, Lion, Spotted Hyena, Blue monkey, yellow collared lovebird, Ostrich, Kori Bustard, Ground Hornbill, gerenuk, Black and White Colobus, Flaming, and Eland. ONGOYE FOREST: Situated in South Africa is the Ongoye Forest. The forest is on a granite ridge in the inland of the town Mtunzini in KwaZulu-Natal. It has total area coverage of 4000 hectares. Ongoye Forest has vegetations including Forest Water berry, Zulu Bead-string, Natal Krantz Ash, Forest Mangosteen, Natal palm-nut, Natal Olinia, Giant Umzimbeet, Natal White Stinkwood, and the Pondo Fig. The forest is home for numerous wildlife including; the Crowned Eagle, the spotted thrush, the Red Bush Squirrel, the Woodward’s barbet, the Euryphura achlys, the Dwarf Chameleons, and the Bronze-naped Pigeon. Major activities in the Ongoye forest include Trail walking, Agriculture, Camping, and Bird watching. NEWLANDS FOREST: Newlands forest located in the suburb of Newlands, Cape Town, is a conservancy area on the eastern slope of Table Mountain. The forest is maintained by the Table Mountain National Parks Board alongside the City Parks Department of Cape Town. The Newlands forest has a total coverage area of 400 hectares. Vegetation harbored by the forest includes: the Silver tree, the yellowwood tree, the woodsy creek bed, and the silver tree flower. Wildlife includes: Grassbird, Southern Double-collared Sunbird, Alpine Swift, African Black Swift, White-rumped Swift, Chaffinch, Cape White-eye, Black Saw-wing Swallow, Great Striped Swallow, Cape Canary, African Olive Pigeon, ground hornbill, monkeys, and the African wild dog. MOUNT CAMEROON AND BIOKO MONTANE FOREST: The Mount Cameroon and Bioko Montane forest is located in the volcanic chain that extends southeast towards the Guinea islands of São Tomé Principe and Annobo, and northeast along the border between Cameroon and Nigeria. The forest has a total coverage area of 400 sq miles. The montane forest of Bioko and Mount Cameroon is home to the Afromontane flora of Africa’s high mountain. Vegetations in the forest include: Mangroves, Heathlands, Montane grasslands, Montane forests. Wildlife in the region includes: shrew, Hun shrew, black colobus monkey, drill, a brush-furred mouse species, spotted monkey, Preuss’s monkey, and the Cameroon climbing mouse. CROSS-NIGER TRANSITION FORESTS: Located in the southeastern part of Nigeria is the Cross-Niger transition forests which are a tropical moist broadleaf forest. The forest is between the Cross River on the east and the Niger River on the west with a total coverage area of 20,700 Sq Km. The forest cuts across the states of Abia, Anambra, Akwa Ibom, Imo, and Ebonyi. Wildlife includes: the African Buffalo, Cheetahs, drill monkey, hippopotamus, leopards, lions, baboons, elephant, red-capped mangabey, warthogs, caracal, and over 900 species of birds. Vegetation in this region includes: Savanna grassland, Shrub and acacia wood, and the mangrove swamp vegetation. BUDONGO FOREST: The budongo forest is located in the Western part of Uganda in the districts of Hoima, Masindi, and Buliisa. The forest is within the boundaries of the Murchison Falls National park, about three hours drive from the popular Kampala City. The forest has a coverage area of 825 Sq Km. Wildlife in the forest includes: lions, Rhinos, Buffaloes, Hippopotamus, Cheetahs, elephants, giraffe, chimpanzees, zebras, and bird species like the Puvels and Illadopses. The vegetation includes: tropical forest mainly, grassland, Iron-wood trees, and woodland Mahogany. African forests play a very important role in the conservation of the world’s ecological system. In relation to the world, forests have been found to cover a third of all the land on Earth providing necessary organic infrastructure for some of the Earth’s densest and most diverse collections of life forms. Africa’s forests support countless species of life forms. A large proportion of the world’s birds, animals, and insects occupy these forests. Countless global businesses depend on the forest regions of Africa. Africa’s forests and woodlands are classified into nine different categories which are; tropical rainforests, tropical dry forests, tropical moist forests, tropical shrubs, tropical mountain forests, sub-tropical humid forests, sub-tropical dry forests, sub-tropical mountain forests, and plantations. With the worlds per capital forest cover standing at 0.6 ha per person on the average, Africa has a high per capital forest cover of 0.8 ha per person, and Africa forests account for about 6% of the continent’s gross domestic product (GDP) which is the highest in the world. The ecological importance of Africa’s forest to the world cannot be spoken of without the mention of the well-known megafaunas and Floras encompassed in the African continent. The African fauna is simply all the animals living in Africa, and they play a great role in the ecological system in the Afro-tropical eco-region. The savannas house large ungulates, a member of a diverse group of mammals. This includes: antelopes, the African giraffe, buffalo, zebra, wild donkey, and some species of rhinoceros. The carnivorous inhabitants include: the lion, leopard, the spotted hyena, and other carnivores. Africa forest is also home to a special class of artiodactyls mammal called the Okapi found only in the dense forest of the Congo basin. Found in the Atlas region are bears, North Africa, wolves and, foxes. Elephants are found both in the forests and savanna regions. Peculiar also to Africa are the gorillas, chimpanzees, and a few remaining mandrills. The tropical rivers are flooded with hippopotami and crocodiles. Amongst the birds, Africa is notable for the Ostrich and the secretary bird. Others are; the weaver bird, the long-tailed whydahs, francolin, guinea fowl, sunbirds, bee-eaters, the parrots, and kingfisher. Reptiles harbored in the African forest include: the lizards, chameleon, and a number of venomous snakes. Africa also has many thousand different types of insects, most common are the very proverbial locust, the incredible termites, the malaria-spreading mosquitoes, and the fatal tsetse fly which is only found nowhere outside Africa. Another abundant insect is the scorpion. Vegetation in Africa is mostly linked to the distribution of heat and moisture in the continent. The northern and southern temperate zones have a tropical flora which very distinct from that of the continent. We see the countries around the Mediterranean blossoming with the groves of orange and olive trees, cork trees and pines, evergreen oaks, myrtles, arbutus, intermixed with cypresses and fragrant tree-heaths. The humid regions are blessed with richer vegetation, with dense forest having greater rainfall and least variation in temperature. The Mangrove tree is the typical tree in the coastal region; this is basically because the tree flourishes in soils with swamp characteristics. Found in the dense forest of the West African region is a great variety of hardwoods, alongside two palms; the oil palm, and the bamboo palm, which are not found in the savanna regions. Also found are the silk-cotton trees, various timber trees, such as Odum, mahogany, ebony, Oldfieldia, and camwood. The forest also harbors extremely dense undergrowths and luxuriant climbing plants. The most characteristic trees in the savannas are the doum palm, the monkey bread tree, and the euphorbias. No doubt that the forests contribute to the economic and social development of the continent. Despite the challenges faced by these ecological bodies, in terms of threat to the wildlife by humans, and the threat to the forest by deforestation attempts, efforts have been made on the global scale to partner with agencies in alleviating these threats. Apart from the Fauna and Flora of Africa, numerous benefits are seen from these forests as their absence would be more harm than good to the region, Africa, and the world as a whole. Some of the importance of Africa forests is highlighted below. The housing of more than 50% (half) of all known species on earth. The African forests influence its regional weather patterns and thus creating its microclimate. The roots help the ground absorb more of a flash flood, which reduces soil loss and property damage. The Largest forest in Africa is the Congo rainforest known for its high level of biodiversity, cutting across six countries in Africa; Cameroon, the Democratic Republic of Congo, the Republic of Congo, Equatorial Guinea, Gabon, and the Central African Republic. The Congo forest region covers an area of over 695,000 sq mi. The Congo rainforest is the 2nd largest forest in the world after the Amazon forest. The Democratic Republic of Congo is the largest country in the Congo rainforest region containing about 12.5% of the remaining tropical forest in the world. The Congo forest houses the greatest number of mammals, birds, amphibians, primates, fish, and swallowtail butterflies in the whole of Africa. The forest holds more than 1000 species of birds within the forest. The Congo forest is the only known place that shelters three species of gorillas; the endemic eastern lowland gorilla, the lowland gorilla, and the endangered mountain gorilla. The second largest river in the world, the Congo River, flows through the Congo forest. The Congo forest is also the habitat for over 600 species of trees and more than 10,000 species of animals. The Congo basin was ruled by the Kingdom of Kongo between the late 1300s until the 1800s. Most European countries at this time were more focused on other areas of Africa like West Africa and East Africa, but the Kingdom was only partially subjugated to Portugal rule. It was until the influx of British explorers in the mid-1800s that the dense forest of the Central Congo basin was really explored by the likes of David Livingston, Henry Morton Stanley, Richard Burton, and others. It was a Belgium monarch who picked full interest in the Congo basin that eventually caused the region to be won by King Leopold of Belgium after much diplomacy and negotiation during the Berlin conference of 1885. Leopold established the then Congo free state seeking to make it a colonial empire. Despite the name Congo Free State, they were actually there to exploit ivory, natural rubber, and other natural resources within the Congo basin. Due to the brutal rule established by Leopold, the region was annexed by the Belgian government and bore the Belgian Congo from 1908 until 1960. From the beginning of the Belgian Congo, rulers traded rubber, oil palm, and other natural resources. Congo basin was one of the five major suppliers of natural rubber in the world. Another point where we see the Congo basin coming into play in history was around the late 19th century with the invention of the automobile. Rubber was important for making tires. Thus the demand for it was high. With the numerous natural resources embedded in the Congo basin, high demand was on the natural resources in that region. Congo basin is rich in wood, diamonds, gold, and even coltan-rich ores (columbite and tantalite). Coltan is a material used by communication companies to make mobile phones. This material is a major component in our tablets, Androids, the Samsung Galaxy series, and even iPhones. The rainforest regions were key players in shaping the history of most of the kingdoms and areas within those regions. Most of the kingdoms around the rainforest flourished during the pre-colonial period. They developed their own political structures, customs, tax payment systems, religious ideas, writing systems, agricultural techniques, and even a unique iron working technique. Notable Kingdoms that flourished during 500BC to 1450AD in our era included: the Kongo Kingdom, the Benin Kingdom, the Empire of Ghana, the Empire of Songhay, the Nok civilization, the Mande, the Kingdom of Bunyoro-Kitara, the Empire of Mali, the Oyo Kingdom, the Mossi Kingdoms, etc. The founders of the Kongo Kingdom settled around the lower Congo River around the 12th century of our era. The soil was very rich and fertile between the savanna area and the forest, these attracted farming communities to settle there. By the 1400s, one Kingdom was created by uniting these communities. Their ruler was called Manikongo, and the capital was Mbanza Congo. Another notable Kingdom was the Benin Kingdom which began in the 900s when the Edo people centralized power in the rainforests of West Africa. They created a wealthy Kingdom and a powerful monarchy with their ruler being the Oba. Eventually, the Obas grew their Empire and also engaged in trade with merchants from Europe. Ghana was also a kingdom in the south of the Sahara Desert and northwest of the River Niger. The kingdom was at its peak around 800 CE with a lot of trading activities boosting their economic base. The highlight of the economy was the sale of kola nuts (which centuries later became a secret ingredient for Coca-Cola and Pepsi Cola), gold, and ivory in exchange for salt. In the whole of African history, the people of the African rainforest were unique for producing the most dominant and diverse language groups in the continent. Most profound of these people are the Bantu people of West Africa who explored more lands than any group in the history of Africa. The Bantu people are made up of several indigenous groups in sub-Saharan Africa, and they spread over areas from Central Africa to the African Lakes down to Southern Africa. The total number of Bantu languages is estimated between 440 to 680 distinct languages with the number of Bantu speakers around 350 million. According to some historians, the Bantu people expanded into central Africa around 1500BC, the Great Lakes and East Africa around 1000BC, and the Southern region around 500BCE and continued expanding. During their expansion, they came in contact with hunter-gatherer communities that adopted Bantu languages as the new business language of the new societies under formation. AGRICULTURAL PRODUCE: Farming was a major part of the lifestyle of rainforest inhabitants. They were also known for trading their own farm produce for other items within their community or outside their community along the interior rivers of Sub-Sahara Africa. 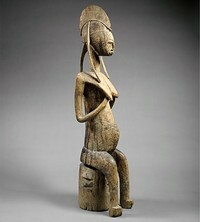 Wooden and Terracotta sculpture: This was predominantly seen with the Nok civilization which was the earliest sub-Saharan producer of Terracotta sculpture. This was around 1500 BCE to 200CE. Bantu migrants may have taken these technical skills with them to Southern parts of Africa resulting in the culture that produced the Lydenburg Heads. Wooden Canoes: notable in this category is the Lake Chad Canoe, the oldest canoe in Africa and one of the oldest in world history. It shows one of the inventions of residents in the rainforest region. Kola nuts: The Ghana Kingdom was known for its Kola nut production which later became a major ingredient for the production of the world’s most popular drinks Coca-Cola and Pepsi Cola. The Talking Drum: This was another invention from Africa that exploited the speed of sound (and wave technology) long before the invention of the radio and the fiber optic. The talking drum was notable for sending messages over 160Km in about 2 hours. Other inventions include the bow, the arrow, poisoned arrows, iron smelting and products in the Air mountains (around 3000 – 2500BC), the lost wax technique (now used in making cars and other industrial products), rice, and yams. Deforestation. Africa is losing 4 million hectares per year according to the FAO. Mining has also been a great challenge to the African forests.